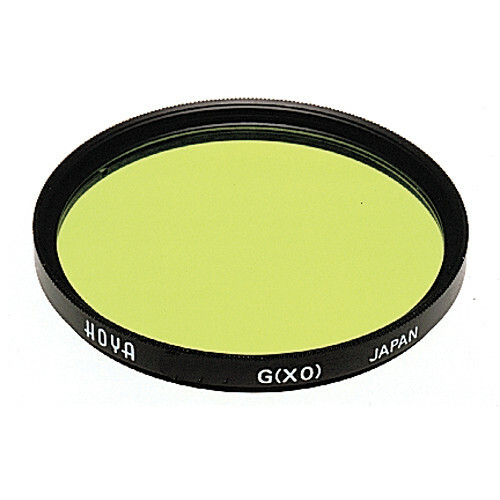 A unique filter for affecting contrast when working in black and white, the 46mm X0 Yellow-Green HMC Filter from Hoya helps to lighten green tones while darkening red tones. It is particularly well-suited to outdoor portraiture due to its ability to lighten foliage and produce corrected skin tones with enhanced facial detail. The filter is constructed from optical glass and has a six-layer HMC coating to reduce surface reflections and glare in order to retain high image accuracy, clarity, and contrast. It is mounted within a durable, lightweight aluminum ring, which has a hard anodized finish to guard against wear. Yellow-green filter is well-suited for outdoor portraiture due to its ability to darken red tones and lighten greens. Greenish color emphasizes skin tones and detail in facial expressions. Designed primarily for black and white photography, this filter can also be used for color applications to produce a distinct color effect. The Hoya Multi-Coating (HMC) uses a six layer, three-per-side, design that helps to noticeably reduce surface reflections and glare for improved contrast and image fidelity. Aluminum filter ring is both lightweight and durable and features a hard anodized finish to guard against scratching and wear. Box Dimensions (LxWxH) 3.4 x 2.8 x 0.5"